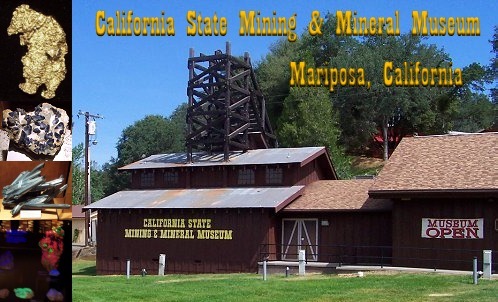 On my return trip from the 2004 Costa Mesa show I decided to veer right on hwy 99 and head for Mariposa where the California State Mining and Mineral Museum is now located. 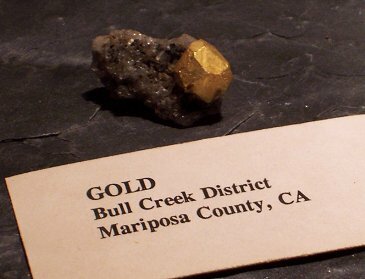 This material was originally housed in the Ferry Building in San Francisco but was moved to this locale, in the Mother Lode region of California, about 15 years ago. Mariposa is a small gold mining era town situated in the Sierran foot hills at the junction of Hwys 140 & 49 about half way between the Central Valley and Yosemite National Park. I first saw specimens from this collection when it was still at the Ferry Building in 1980. This was my first opportunity to see the museum since that time. 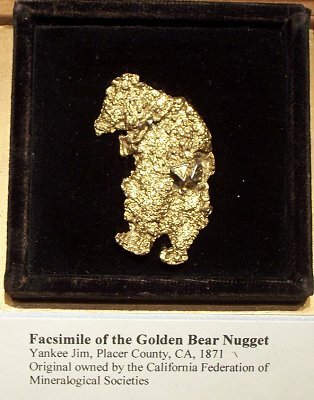 The museum is divided into three themes - with a simulated underground mining display to give you a sense of what it is like in a mine, a large area devoted to explaining what mining is; what mining has occurred and is occurring in California; how man uses minerals, and of course an equally large area with displays of specimens of minerals with an emphasis on California. 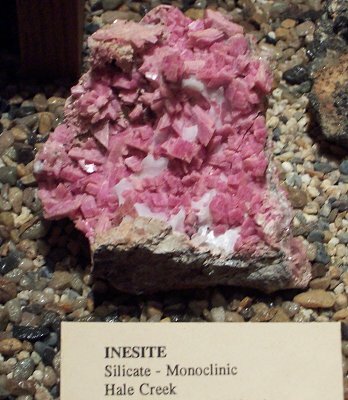 Museum curator, Peggy Ronning, who is quite friendly and approachable, explained that she inherited a collection of over 13,000 mineral specimens! Only a small fraction are currently on display. 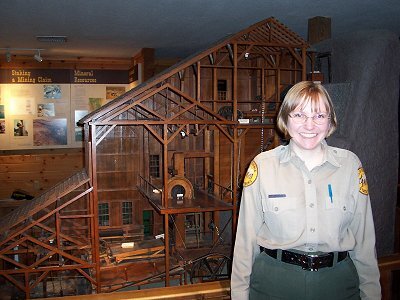 She is actively working to get the specimens organized as there was some level of confusion with the move from San Francisco to Mariposa. A daunting task given that the "show must go on" while the work on it is being done. 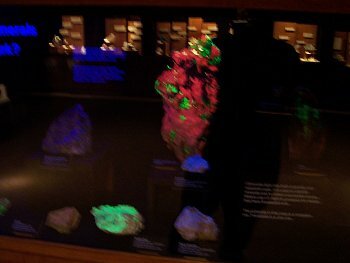 I spent about 1 hour there taking pictures and viewing the minerals. Below are pictures of what is on display. 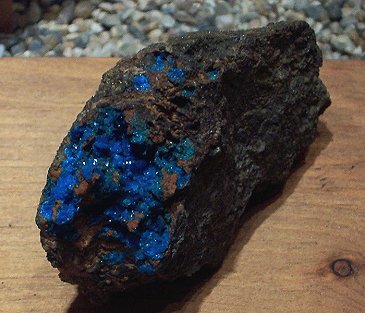 There are several hundered minerals on display so this only represents just a small fraction. 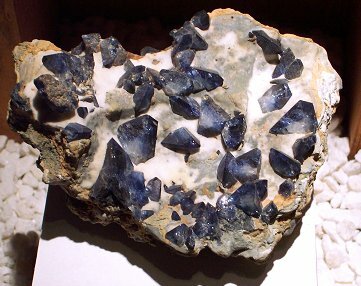 large cases devoted to benitoite and minerals from the Benitoite Gem Mine at the museum. 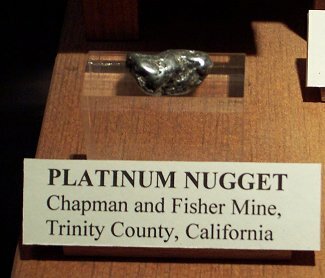 found at the mine which is situated in southern Trinity County. 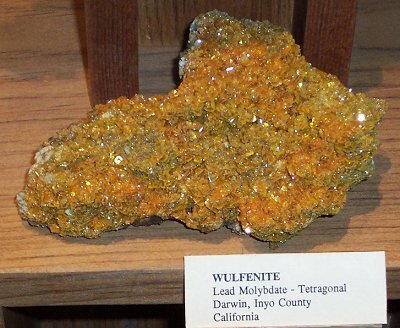 Here are two more specimens from California: Wulfenite from the Darwin district and a 1 cm dodecahedral crystal of gold from Mariposa County. 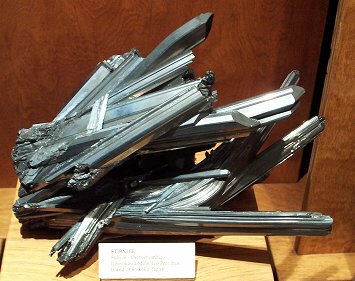 from Cornwall and this large cabinet specimen of stibnite from Japan. room light and under ultraviolet light. 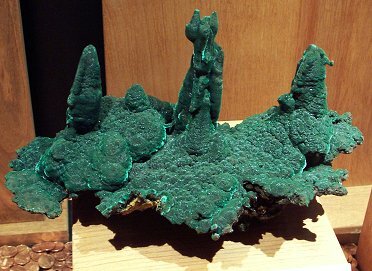 I also saw this large malachite specimen from Bisbee. Thanks again to Peggy Ronning for the fine displays and positive energy!